I just came across JournalTOCs. It is a website for, and I am quoting, “anyone who’s looking for the latest or most current papers published in the scholarly literature with international coverage”. 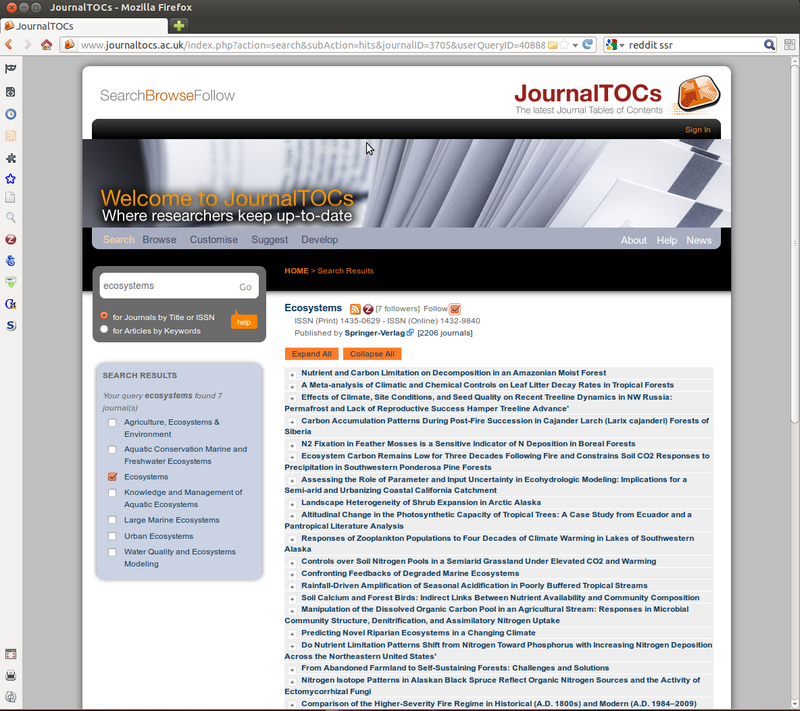 It is a free service with a very large searchable collection of scholarly journal Tables of Contents (TOCs). What I particularly like is that you can save your search results directly to your Zotero collection. Citation can be “grabbed” simply by clicking on a in your web browser address bar if available on this web page. The citation information displayed on the screen is then saved to your Zotero collection with little or no additional effort. You can also easily subscribe to the RSS feed of the journals. In addition, you can search or browse by subject, journal or publishes. All in all, something that might be worthwhile exploring a bit more if you are need to keep track of what is being published in your area of interest. Great to see JournalTOCs news. It is not just following your favorite journals, but your favorite journals will follow you too with a facility to track the number of followers. Highly useful and I am using this for the last 5 months!!!. Great to use the customized JournalTOCs.